It seems only fitting I write this post whilst sitting here with my new Love Lettuce mask on. Recently my LUSH collection has been dwindling away and it was about time I put some new little treats in there. I made my way into town and whilst I was on my way to the ticket machine, a lovely couple gave me their ticket with 30 minutes left on (how nice is that!?). I didn't want to seem rude, so I took the ticket and made it my mission to get to LUSH and pop into a few other stores in just 30 minutes! After a quick dash in and out, my LUSH box is looking a little more plump. I knew I definitely needed to get my hands on a fresh mask. As much of a LUSH fan I am, I never get the masks, I think I've tried them once or twice but not enough to have a real opinion on them. Masks are such a lovely way to unwind and really treat your skin. One of my goals for the rest of the year is to try more masks and do one at least once a week. I picked up Love Lettuce - a soothing, brightening mask, packed with natural Seaweed Gel, Honey and Almond oil, to moisturise and brighten your complexion. This mask also contains Almond shells to gently exfoliate your skin. 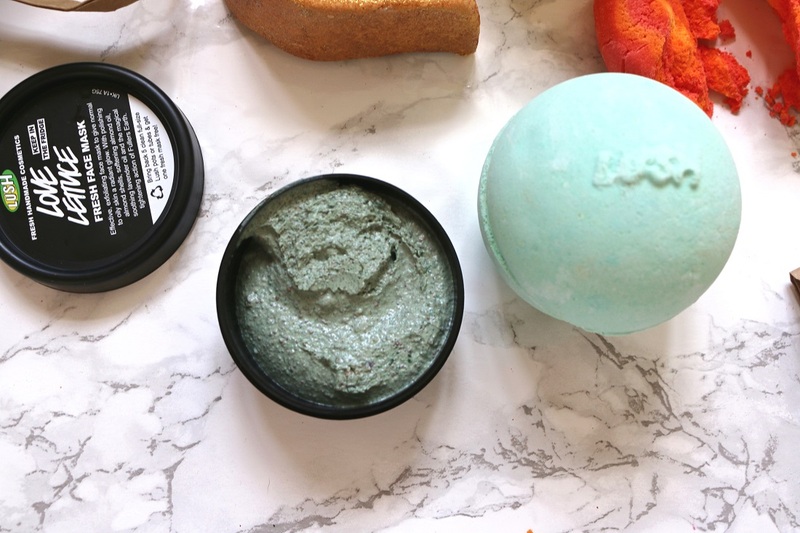 This is suitable for oily to normal skin and sounds like the perfect pick me up! It smells absolutely gorgeous thanks to the lavender oil, I can't wait to do a proper review and tell you all about it. Now I can't seem to go into LUSH without picking up Avobath. It's definitely one of my favourites. I love this for when I want to relax and unwind and get rid of any stress. I'm a massive citrus scent lover, so for me the Lemongrass and Bergamot oils are heavenly and so refreshing! Avobath is the one I grab if I'm feeling a bit groggy, or under the weather. It's an instant pick me up, that's also super moisturising thanks to the Avocado and Olive oil. As you already know I'm a sucker for the citrus scents, so of course a Fizzbanger made it into my basket. To me this is one up from Avobath, this is for when you want the full works - fizzing, popping, colours - you name it, Fizzbanger has it. This is the perfect blend of citusy Apple, Sweet Cinnamon and soothing Ylang Ylang, making this equally soothing and relaxing as Avobath - but with a bit more of a punch! I can't go into LUSH without picking up some kind of bubble bar and as it's Summer, I thought I'd pick up a gorgeous fruity and yep you guessed it, citrusy bar! I got my hands on Brightside Bubble Bar. I love how generously sized this is, you can easily use this 3 or 4 times - thanks lush! As you have already probably guessed by the colour, this is packed full of delicious sweet orange smelling goodness. The Sicilian Mandarin, Bergamont and Tangerine essential oils, will leave you feeling uplifted, refreshed and ready for anything! I'm sure by now you've probably sensed a general theme going through my head whilst I was in LUSH, Yes OK I got another sweet citrus goodie! 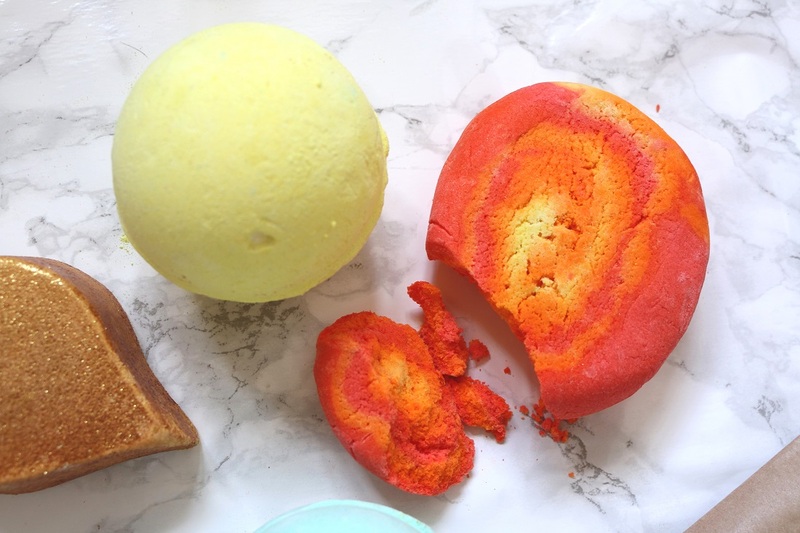 This time I picked up Sunnyside Bubble Bar. I don't think I've ever tried this, but of course thanks to the Sweet Orange, Tangerine and Lemon oils, it's right up my ally! I just love a good uplifting, refreshing scent in the Summer! As you can tell it's suuuuuper shimmery! It's a bit messy but I just know this is going to be so fun to use. 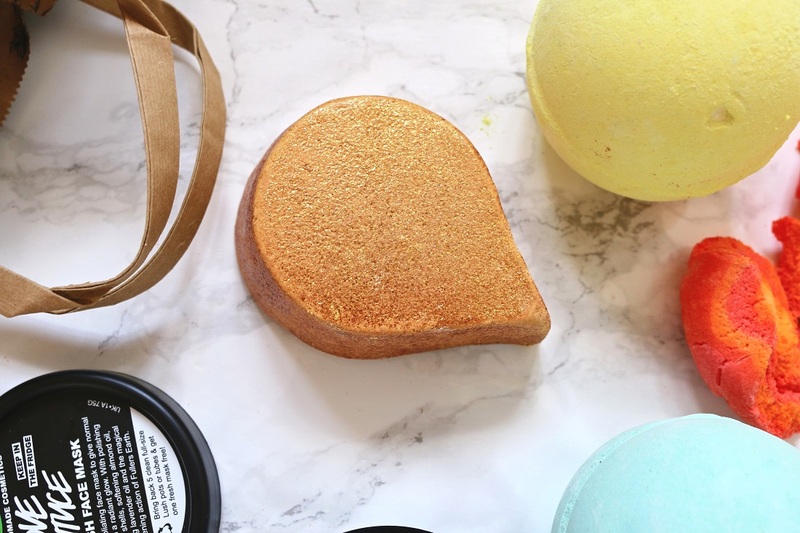 It leaves your water so velvety and shimmery - so luxurious, I can't wait to try it out. This is definitely one of those ones for special occasions (and not for a hair wash night!). Have I picked up any of your favourites? 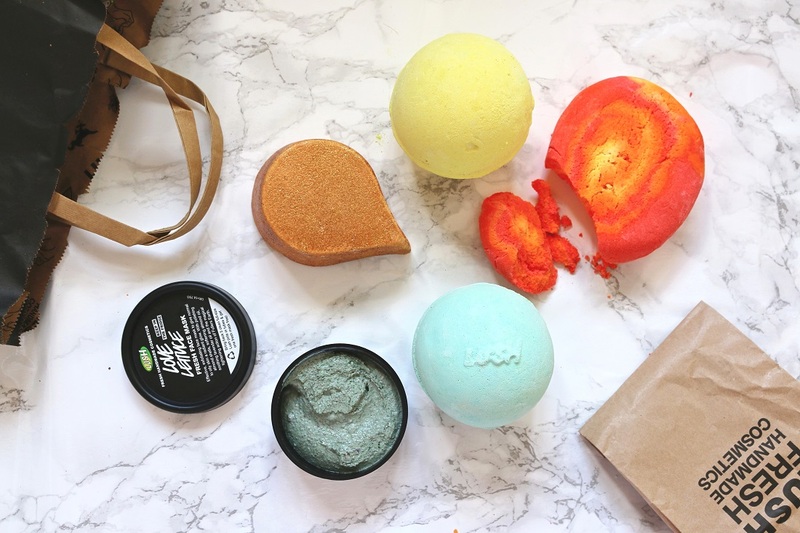 What are your go to LUSH goodies? Oh yes try the masks if you can, they're so nice and refreshing :) Oh lovely! Thanks so much! Oh I'm like you, as soon as someone talks about a LUSH product I'm persuaded and want to try it haha! i haven't been to lush in ages and my bath is in serious need of an update. will go asap.